BREATHTAKING AT FIRST SIGHT! THE MAJESTIC FULL HEIGHT ENTRY OF THIS STRASBOURG MODEL IS DWARFED BY THE ENTIRETY OF THIS WHITE BRICK DRAMATIC CHATEAU. The Sensational Two-Story Entry features a Winding Iron-rod Balustrade Staircase, Glass French Doors leading to the Den, Columns flanking the Great Room Entrance. An Elegant Private Dining Room finishes your initial experience. The Palladium Cathedral Windows of the Great Room provide the Interior Balcony a Birdseye View of the Backyard. Ambiance from the See-thru Fireplace is shared by both the Great Room and the Hearth Room, located near the Updated Gourmet Custom Kitchen. Granite Counter Tops, Large Center Island with Seating, New 5-Door French Refrigerator, Double Oven, Pantry, Breakfast Nook and Serving Peninsula create a Wonderful Entertaining Space. The Upper Level features Three Bedrooms-Two en suite with Separate Walk-ins and Jack n Jill Bath. 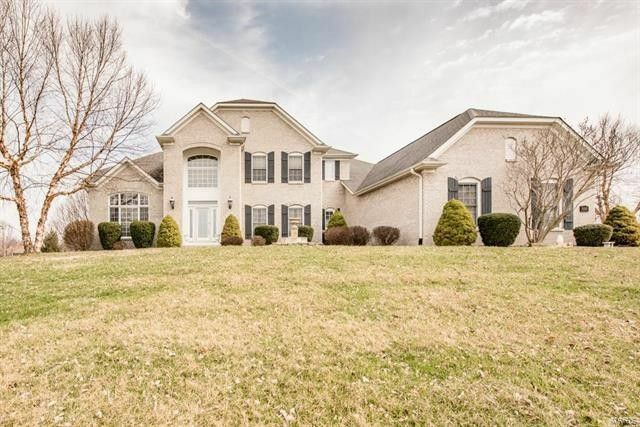 Walk-out Basement w/5th Bedroom, Bath, Kitchen, Family Room and Rec Room. STUNNING! Directions: Rt 159 North to Munie Rd, head east OR Old Collinsville Rd to west on Munie Rd, north on Eiffel Blvd. (Chateaux at Woodfield Entrance), rt (east) on Renoir Ave, House sits on the northeast corner of Pascal and Renoir.